The hall was transformed into a celestial scene awash with twinkling stars to launch the First Story Writing Workshop’s poetry anthology Our Words Run Deeper Than The Earth on June 15th. 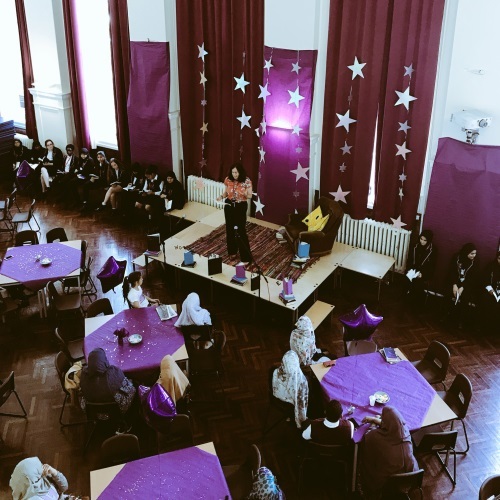 The 23-strong group of Year 9 poets reduced many of the parents and teaching staff to tears by reading their raw, powerful and honest words on a range of topics from family life, grief, sexism as well as what it is like to be a Muslim girl today. Poet-in-residence Rebecca Tantony told how the girls had “blossomed” during her weekly workshops producing intricate and heartfelt writing which made her feel “honoured” to have worked with them. Lead teacher Ms Stone-Lee described how the girls had gained such confidence and skill they could “now fill the world – in fact the galaxy - with their amazing words”. The girls were thrilled to take home copies of their first books to treasure forever and felt incredibly proud of overcoming their nerves to perform in front of the audience.